I no longer build startups using a linear approach – that’s the process inherently integrated into canned startup business plan software, and taught by MBA programs for nascent entrepreneurs. My startup process is highly iterative. Product concept. Competitive / market research. 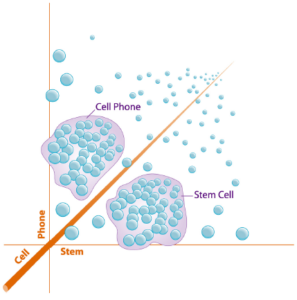 Revisit product concept for differentiation. Patent research. Revisit product technology (and product roadmap) for competitive positioning. Reassess the market (tech trends, socioeconomic trends, economic trends, etc.). Look for and align with convergent trends. I never start a plan with market research. Market research retrospective, and typically written or compiled by journalistic observers and analysts who have never operated a lemonade stand. In short, it’s nearly useless as a future vision tool. Simply put, people can’t appreciate or evaluate something if they have no knowledge of it. On the other hand, patent research is prospective and teaches more about where I need to place the company and products for competitive advantage and exit value. Unicorn (the products, market, model, etc.) is driven by the end-game, the exit. Unicorn (the company) is the product that I’m building and its ultimate customer is a strategic acquirer. When and how this happens is fundamental to our business plan. After setting aside the initial product/market concept for Unicorn, I dug for the answers to a few key questions: who are the potential acquirers in the industry, what makes them tick, is the industry M&A active, and what’s their 3-5 year trajectory. The answers shaped Unicorn’s core structure. Patent research, on the other hand, is prospective gold mine. It’s more reliable, more objective, and reflects serious investment by the leaders who will shape the industry’s future – in some industries, it reflects $5 million to $10 million in R&D investment per granted patent. This is going to get a little geeky. Although patent analytics is an obscure science, it’s an industry that I helped create (and have patents in). It’s an expertise that I share with only a handful of peers around the world. Patent trajectories DO produce useful predictive research data literally showing where the big companies are pushing their industries. 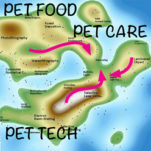 The first patent landscape map the targeted pet food industry, and provided useful future insight. My patent landscape analysis literally showed me which companies were investment how much money to be where their product roadmap would take them 3 years hence. Crystal clarity! But, then I overlaid the landscapes of the adjacent pet technology and pet care market players, and a very interesting picture emerged. It became instantly clear that the patent trajectories core technologies and processes in these typically siloed pet food, pet tech, and pet care segments were converging. It appeared like the proverbial treasure map “X“. That was the go-now, go fast signal. Establishing a solid priority date on Unicorn technologies in advance of the convergence drove many product and marketing decisions – mores than any $4,000 market research report. My job then centered on creating the technologies, products and services that extended beyond “state of the art”, as defined by the industry giants’ patents and applications. Patent mapping shaped Unicorn’s next first and second generation products and services. During the three years following my patent analysis, effort was focused on designing, defining, refining, and filing dozens of patent applications on devices, technologies, processes, systems and methods that would establish Unicorn as the IP front-runner in a new category that transects these three pet industry segments. With the company’s model and products aligned with the major pet market trajectories, Unicorn is positioned for high confidence competitive market entry … and high value exit. As I pointed out in the first line of this blog, the process is iterative – so once more, we return to market research / market validation. * Image Source: James F. Ryley, Jeff Saffer, Andy Gibbs, Advanced document retrieval techniques for patent research. Elsevier World Patent Information 30 (2008) 238–243.